Like most websites, we make money from advertising. But Petful® is different. We use that money for good. We have always set aside and donated a sizable portion of our net advertising revenue. That has meant hundreds — and lately, thousands — of dollars each year to help animal shelters, groups or related causes we believe in. Other ad revenue is recycled right back into this website to cover our expenses so we can meet our other major commitment: to give our readers the tools they need to have happy, healthy pets. You’d be surprised what a difference a small donation can make to a nonprofit charity. In 2011, when we were starting out (and were then named Pets Adviser rather than Petful), we were able to put together $200 for the Surfin’ Santa Paws Howliday Giving Drive from the “SURFice dog” Ricochet, the ASPCA’s Dog of the Year. 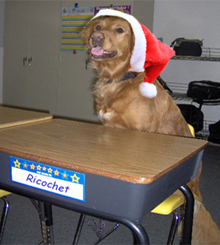 This event was more than a “paw it forward” gift drive for children with illnesses; it also was a way for Ricochet to visit elementary schools and teach hundreds of schoolchildren how to treat pets with kindness and respect. As our website grew, we were in a position to make larger donations. In 2012, we were a sponsor of the Brooklyn Mutt Show, donating $500 to help defray expenses to run this event, held yearly to raise money for charitable causes. The 3rd-annual Brooklyn Mutt Show raised funds for both the Sean Casey Animal Rescue and the Wild Bird Fund. In May 2012, we made 2 separate donations of supplies totaling $100 to Purrfect Pals, a no-kill sanctuary for homeless cats in Arlington, Washington. Purrfect Pals is the largest cat-only adoption organization and sanctuary in the Pacific Northwest. In July 2012, we donated $100 to the Poodle Rescue of New England, an all-volunteer group that rescues and rehomes poodles and poodle mixes. In October 2012, we teamed up with Embrace Pet Insurance for our annual Halloween costume contest. Thanks to the generous support from Embrace, we were able to offer a $1,000 donation in the grand prize winner’s name to the animal rescue of her choice: the Newfoundland Club of America Rescue. The NCA rescues and rehabilitates Newfoundlands all over the country — some badly injured, others near euthanasia. In 2013, we also became a major sponsor by donating $1,500 to the Presidential Pet Museum Foundation in Glen Allen, Virginia. This unique museum, struggling to stay alive, provides educational and inspiring features about the presidential pets that help teach the history of our nation — and also emphasizes responsible pet care and promotes the welfare of animals that enrich our lives. Chris Phillips, adoption office manager, and a staff member named Jon accept the $600 donation from Petful (we were known as Pets Adviser back then). November 2013 saw a flurry of donations. 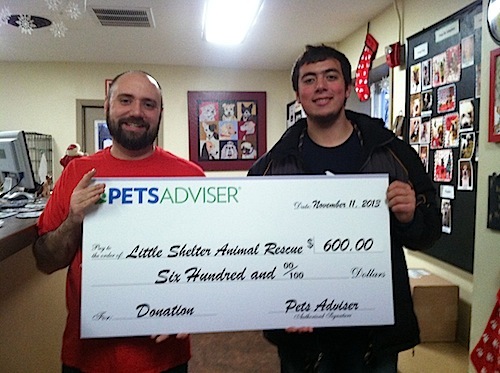 We proudly presented a check for $600 to Little Shelter Animal Rescue and Adoption Center. We also sent $75 to the Austin Humane Society; $75 to the Greater Chicago Ferret Association; and yet another $75 to Boston Terrier Rescue Team of the Carolinas. And we weren’t done yet! 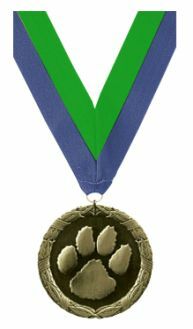 We also submitted a $200 donation to St. Tammany Humane Society in Louisiana. Also, in May 2014, we donated $100 to Carolina Hearts Aussie Rescue, a volunteer-based organization whose purpose is to rescue and place herding dogs into forever homes. Herding dogs do not do well in shelters and typically shut down. This group works throughout the Carolinas to find permanent, loving homes for these dogs. During the summer, we gifted $100 to Multnomah County Animal Services, in Troutdale, Oregon. MCAS is a government-run agency that offers adoption, lost & found, and rescue services to the local community. It is the only “open-door” shelter in the Portland area. Stacy Price accepts our check on behalf of Boston Terrier Rescue of East Tennessee. 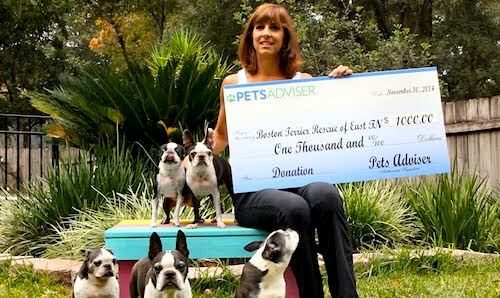 In November 2014, there was another wave of donations — starting with a check for $1,000 to Boston Terrier Rescue of East Tennessee, a nonprofit organization that rescues Bostons all over the Southeastern United States. Many of the dogs saved by BTRET are too old or too sick to be adopted, and require medical care. In addition, we donated $250 to Friends of Colusa County Animal Shelter (FOCCAS) in Maxwell, California; $250 to Pugs For Pinky; and $250 to Down South Dog Rescue of Murfreesboro, Tennessee. $500 to Paws and Claws Animal Rescue, Inc., of Hebron, Kentucky, which has 1 mission — “to give as many dogs, cats, puppies and kittens a chance at the best furever life they can have.” The donation was put toward vet bills for rescued “PACfurbabies,” and Paws and Claws told us our donation could not have come at a better time. This was a rebuilding year for us. 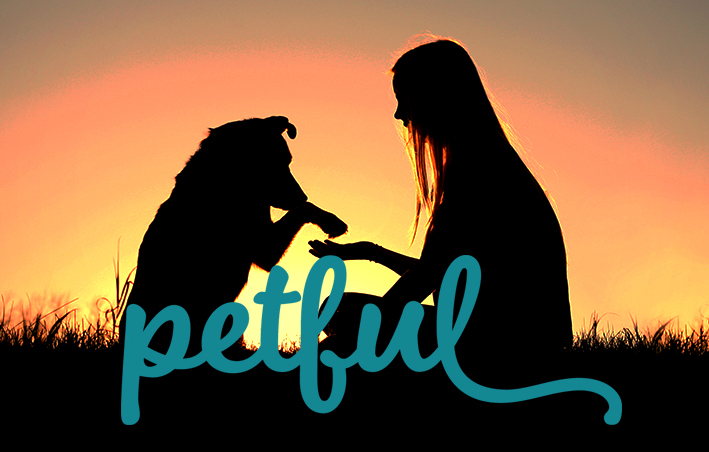 Pets Adviser rebranded as Petful and moved to a new website, a process that took much of our time and a lot of our financial resources. 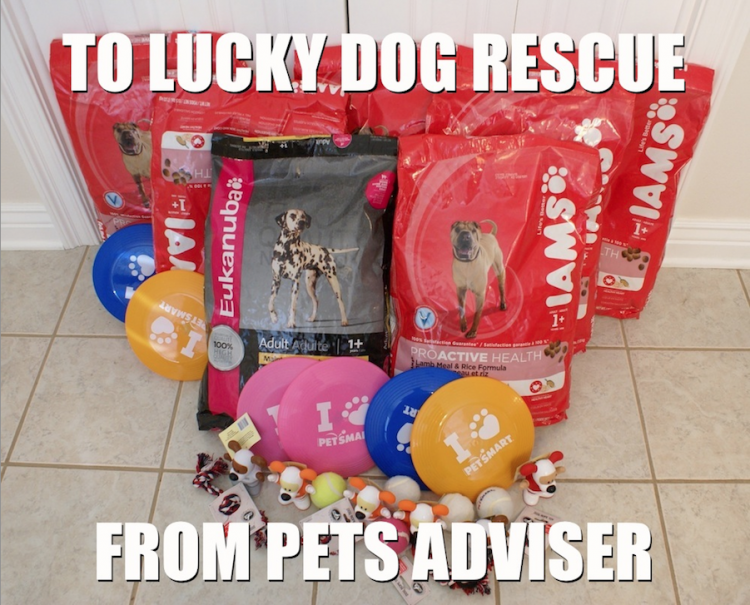 Even so, we knew it was important to continue our mission to help as many animals in need as possible. 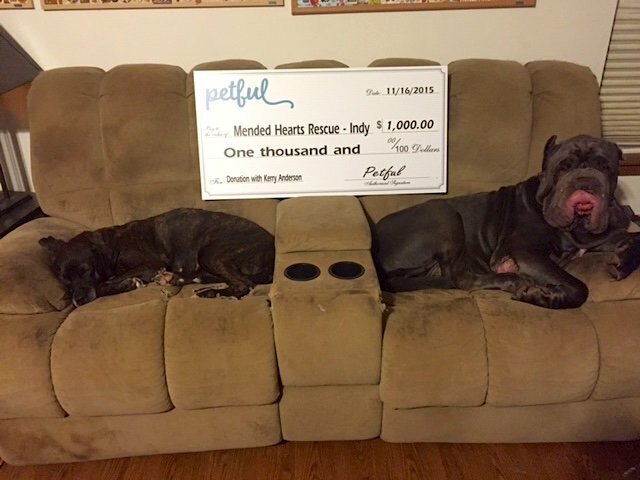 Mended Hearts Rescue’s top dogs accept our check for $1,000. Also in November 2015, we donated $500 to Sweetpea Friends of Rutland Animals of Paxton, Massachusetts, after a devastating fire. In May 2016, we donated $75 to Delaware Valley Doberman Pinscher Assistance, Inc. (DVDPA), which supplies food, shelter and medical care to Dobermans in its program until a forever home can be found. 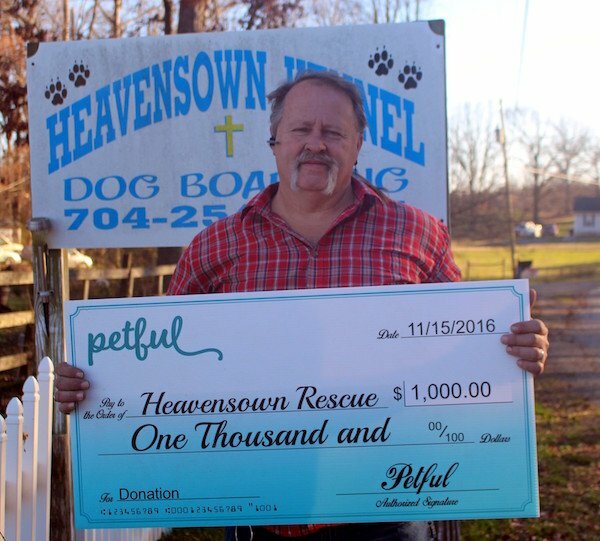 Later, in fall 2016, Petful gifted $1,000 to Heavensown Rescue in North Carolina. Heavensown rescues, fosters, and adopts dogs and puppies. Each one receives a name, love and a chance at a better life. Also in 2016, we sent gifts of $275 each to Animal Rescue New Orleans; Foster Paws Rescue of Greenville, South Carolina; and Cause 4 Paws of Locust Grove, Virginia. 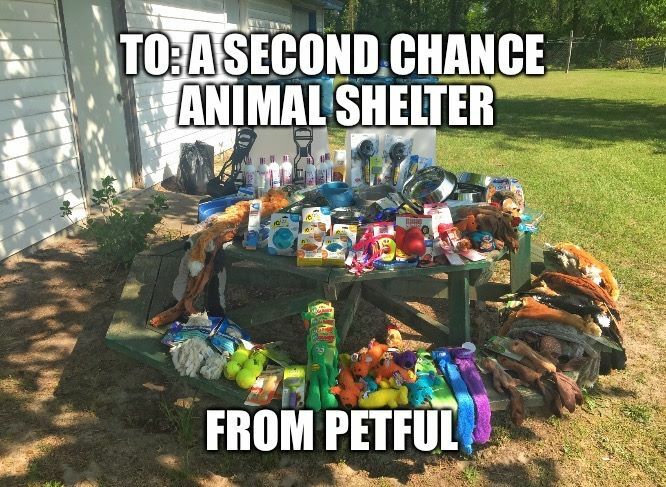 As part of our ongoing commitment to help animals in need, Petful proudly donated $1,500 worth of brand-new pet merchandise — dog and cat toys, food and water bowls, leashes, collars, chews, shampoo, nail clippers, cat litter and more — to A Second Chance Animal Shelter, a no-kill shelter near where Petful publisher Dave Baker grew up in South Carolina. Also, in May 2017, Petful stepped up with a $1,200 donation to AMA Animal Rescue of Brooklyn, New York, to help save neglected puppies in Puerto Rico who desperately needed medical attention and new homes filled with love. Our hearts went out to these puppies the moment we saw their shocking pictures. In July 2017, we gave $50 to Barktown Rescue of Boston, Kentucky, an organization that has grown, in just a few years, from 2 volunteers to a network of more than 80 fosters and volunteers. Recently, Barktown adopted out its 3,000th dog! In September 2017, we gave another $50 to the Cape Cod Police K-9 Relief Fund, created to help ease the burden of veterinary costs incurred in maintaining a retired K-9 officer. Also in fall 2017, we sent $275 to Wheatens in Need of Katy, Texas; $275 to Animal Advocates of North Texas; and $275 to Magic Happens rabbit rescue of Baton Rouge, Louisiana. 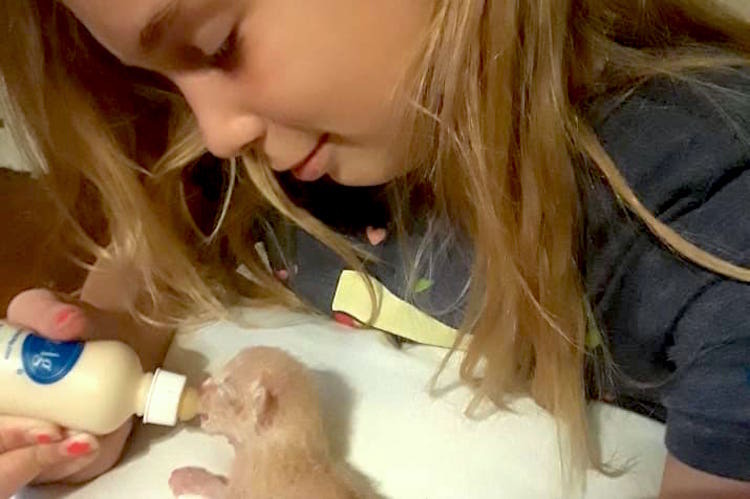 In July 2018, we donated $500 to Greenlee’s Furbaby Mission, a new rescue fund started after the tragic death of 10-year-old Greenlee Marie Buckley, who was electrocuted while trying to rescue kittens. Greenlee was an animal lover who dreamed of one day becoming a veterinarian. Also in fall 2018, we sent $275 to Rescue Village of Russell Township, Ohio; $275 to Harley’s Dream of Berthoud, Colorado; and $275 to the South Dakota West River Spay/Neuter Coalition. In October, we are looking forward to continuing our annual tradition of hosting a Halloween costume contest — and we will once again be giving away hundreds of dollars in donations to animal rescues or shelters of the winners’ choice. Our Charitable Efforts Are Possible Thanks to You! Please continue visiting our site regularly and sharing articles that you like with your friends and family. That’s all you have to do.